My talk show is a Full Chat with Pat today + my deal of the week! Deal of the Week at the end! Twice a year I do a longer Chat with Pat as a full show. My newest book and learning the basics. There are things when we are self taught that we just don't know. I talk about why it's important to understand so that we have more fun! Then a wonderful 'semi live' Q&A with my readers! I got on Facebook and asked for questions.. then answered them as people were writing. "When you are learning you can only absorb so much information. You've probley done this, you've taken a class, and when you leave the class.. there are things that were said that you don't even remember being said because your brain can only absorb so much. I've taken 4 or 5 machine quilting classes over the 20 something years I've quilted. Each time I have different set of skills, a different experience level, I have a different base to build off of. I absorb different information each time I take a class." Join me at my facebook quilt group! I think the Jolly bars are the MOST FUN way to sew up a storm! Each comes with a pattern, and you can add in from your stash or a solid and sew a quilt! Charity Sew Along Block #7 - whirl along with this one! I am pretty darn excited! My version of the Charity quilt came back from the 'Spa' and it's so amazing to see the dark navy background. I promise to show part of it soon.. i want to get the binding on. This is my 3rd year making a quilt to be auctioned for Charity. It's an honor to do this and I am partnering with the Fat Quarter shop & Moda fabrics to raise money for Make a Wish this year. My Quilt will be auctioned, so YOU could own it! The Patchwork Quilt Along is a year full of quilting fun for a great cause! PLUS darling blocks that I'm doing in a totally different colorway than the original. 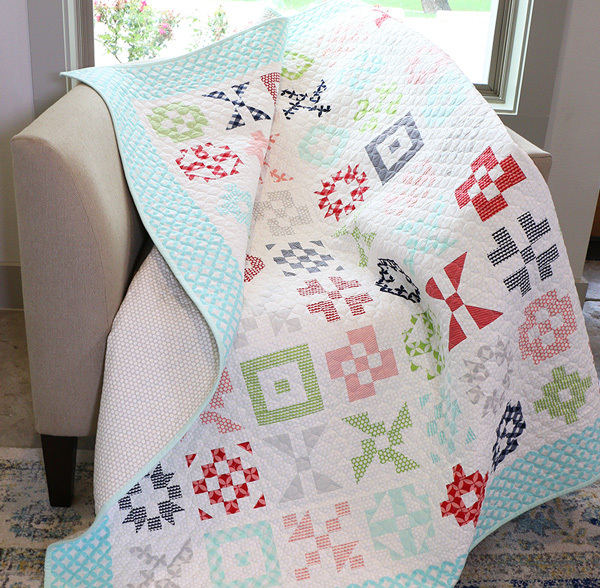 If you love this exact quilt you can Order the Patchwork Quilt Kit & Backing! Block #7 is 'Propeller' and look at how it is on point.. a whole quilt of these alternated with solid blocks of navy would be very cool and kind of a scrap buster.. right? you could even use several dark navy... each block gives me so many ideas! and a Video with tips this month! And I am keeping my blocks tidy with wonderclips & the little Alphabitties numbers & letters! I am thinking of quilting with the new Aurifil 80 wt thread. It's thinner so when you quilt it just blends right it..
Order the Patchwork Quilt Kit & Backing! I have wonderful quilty friends joining along for this great cause! Be sure to check out their blogs every month to watch their process, and to see what fun fabric collections they have selected! Take the Roundabout Sew Along - Sew Part 4! When I design quilt patterns I put my heart and soul into the design. For my fabric line Sunday Drive, I designed 'Take the Roundabout' in my signature multiple size block format. You've been doing my solstice, so you have an idea of how much fun it is do multi size blocks! Twice a month, the 1st and 3rd Friday, I'll assign a section of the quilt to make. If you are just joining me, there is loads of time! I think we'll finish sooner than Thanksgiving, but there are parts that take longer, like the applique. So I'll give you one of the weeks to work on that some more if you have not finished it. This is created with a mix of my Sunday Drive cotton & batik Fabrics! I want to give you a tip. My pattern uses a lot of different fabrics. I think that is what makes it so fun to do, and it's also something you might want to manage by doing a swatch sheet. The photo above is from my good friend QuiltJane of her next Franny & Jane fabric line. She has a small piece of each and taped the number on it. Here is what I suggest you do for my 'Take the Round about' so that you can easily figure out which fabrics you are using. Look at the supply list and either make a copy and cut out each fabric name, or transfer the name to the label/paper. This will give you that working sheet to easily find the fabrics you decide to use! In order to create these style of quilts, you do some different construction. So this has the top of that bottom star as part of the unit above it so you sew straight seams to assemble it. Sew this whole section together. Next post is first Thursday in August! This is a perfect quilt to do 'Quilt as you Go' and I love THIS CLASS for teaching that. Each of the 5 sections is easy to handle. On the 1st and 3rd Friday of each month starting in today, June 2, ending November 17, I'll assign what to sew from my quilt. Down below post whatever part you are working on. This same share will be used for each post so jump right in! Did you select fabric only? share that..trace your shapes.. share that! Made the star or the whole section.. let's see!